It is first time in my blogging history that I am sharing a review again because this product has done wonders on my Skin. 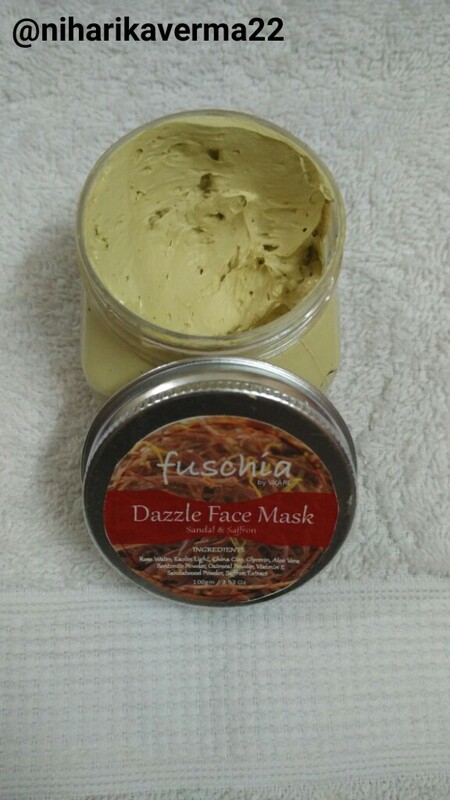 It is about Sandal and Saffron Face Mask from fuschia Vkare. I received it in my August GloBOX. You can check out my post on GloBOX here. It is not just a face mask, it is a Cute Jar filled with magical properties. It is been only 12 days I am using it and it has vanished all my pimples. I have never seen any product or any cream working so fast on my stubborn pimples. I received it for my pimples and I thought just another product which is never going to work. But I was completely wrong. I apply this mask daily and keep it for at least One hour or more than that. The mask is so soft in texture and won't get tight after applying. You can easily leave it for one hour without getting uncomfortable. This pack with cooling and soothing properties is suitable for every skin type. I shared the results on my Instagram too :) I am so happy with it. Not only on pimples but it works on your skin texture and skin tone too. My Tan is removed and skin is more toned, Tight & Bright. So in Short it is a mask with brightening, toning, Tan removing, pimple removing & moisturizing properties without paraben and other harsh chemicals. All in one. Try it and you will never regret it. :) I wanted to share this with all of you that's why I thought to create a separate post for it. Google Apps for Work. Get Professional Customized Gmail (yourName@YourCompany.com). Sign Up for free trial.